I've tried no less than five different times over the years to get it right. After each time, I've been left disappointed and told myself I was not going back. Then, a craving would hit and I was at it again. Five times may not seem like a lot to some of you, but I think it's plenty. Well, I have finally found one that comes as close as I've ever gotten to perfection. I'm talking soft pretzels pretzels, folks. Leave it to Deb over at Smitten Kitchen to hit the nail on the head once again. I'm not going to bother re-posting the recipe. Follow this link to find it and you'll be all set. I followed her instructions to a "t". 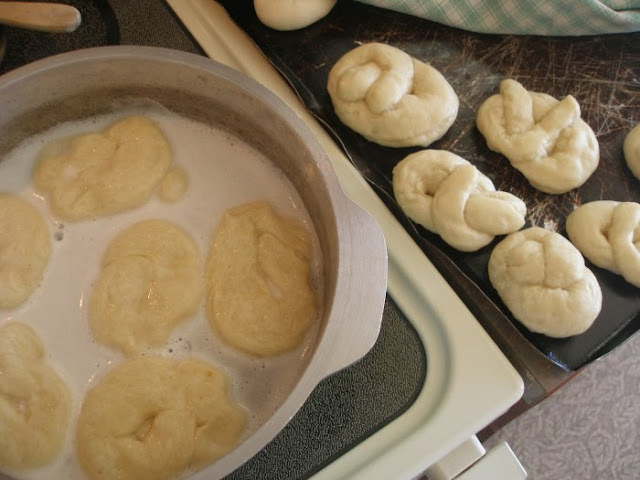 Swollen, strange looking poached pretzels. It's okay. They are supposed to look this weird. While making soft pretzels is time consuming...add the yeast to warm water and sugar: let it sit 10 minutes, make and knead the dough: let it rise 1 hour, form the pretzels: let them raise 10 minutes, poach for 1 minute on each side, brush with egg and sprinkle with salt, bake for 12 minutes...it's is worth it. You don't believe me anymore, do you? Okay, the steps are extensive BUT you can clean up the kitchen, tidy up the school table and shelves, read to the kids and clean up the kitchen some more while you wait. That's what I did and it all worked out fine. The kids made a tray and I made one. As you can see, they like them, too. If you love soft pretzels and you have yet to find a recipe that you equally love, please give Deb's a try. I think you will be very pleased. I am:-). 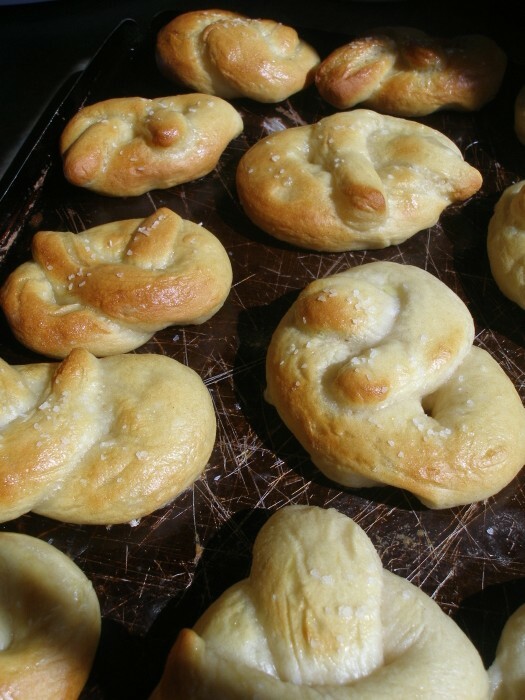 We will have to try this recipe - we love soft pretzels! I've been planning on making pretzels since I fell in love with them in Germany. Thanks for the recipe. 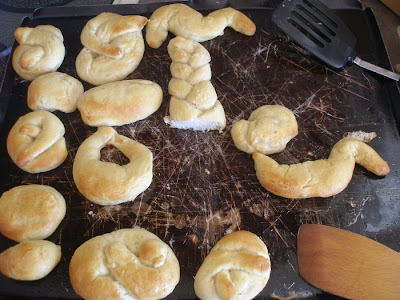 I've only tried home-made soft pretzels once. They actually turned out ok, but I have no idea where I got the recipe anymore. I'll have to give yours a shot! 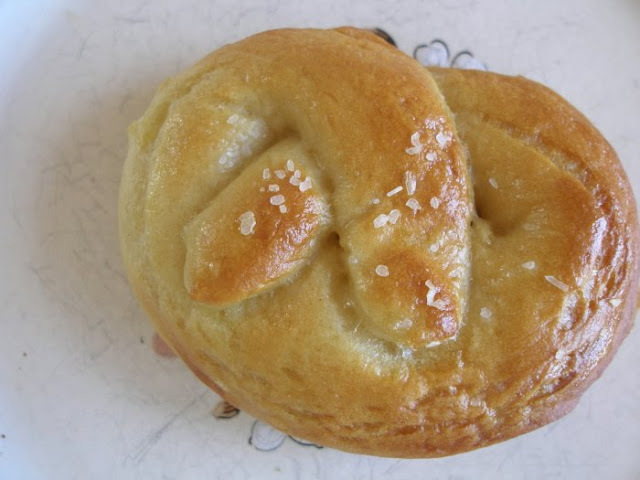 My boys are always begging for soft pretzels from Auntie Anne's (best soft pretzels ever!) whenever we are at our local Walmart. Home-made is so much more cost effective! reminds me of making bagels, which i don't think is too labor intensive. thanks for the recommendation and the link! yours look sooooooo good and remind me that fall fairs are around the corner. They look pretty great to me! Those look incredible!! Good job :) I'll try to remember to make these sometime! 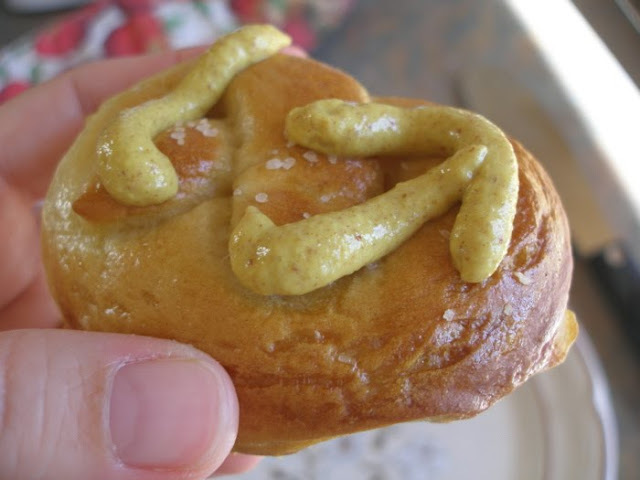 Just want to say - I made these this weekend and they are SO good! Much better than any other recipe I've tried. And I halved it and put it in my bread machine to mix the dough (I'm lazy that way - LOVE my bread machine! ), and it came out really well!! I will definitely be making these again. Thanks! !